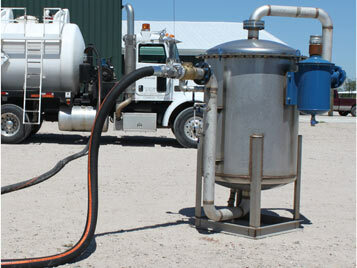 The ELIMINATOR series vapor scrubber units are a completely new approach to scrubbing hydrocarbons and other compounds. 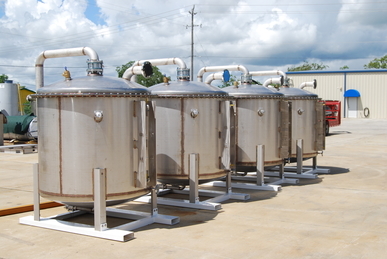 These units remove the potential for "stripping" in conventional packed-column scrubber units. The unique internal structure of the ELIMINATOR scrubber units, coupled with ultra-high efficient absorption chemical medias like our Bio-Scrub X make removal efficiencies as high as 98.5% possible. Actual use of the scrubber units in refineries have shown that on average, 1 gallon of Bio-Scrub X is consumed or saturated for every 1 hour of vacuum truck run time. This is average and would not account for a hot stream which had ppm levels in the % range. These units are skid mounted but with slight modifications could be added directly to some vacuum trucks. Unit requires no pumps or utilities to operate. Chemical costs as low as $7.80 per gallon for hydrocarbon applications! We currently have three Eliminator size units available for rent. We have the 450, 550 and the large 5500 models available for rent or purchase. 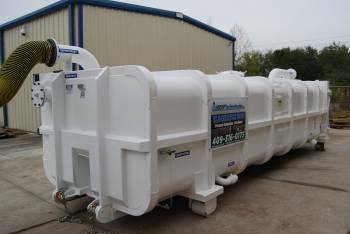 In addition, custom units are available for specific applications and flow rates. Windows - click the link with your RIGHT mouse button. Select "SAVE TARGET AS..." or "SAVE LINK AS...". Macintosh - HOLD the mouse button on the link. Select "DOWNLOAD LINK TO DISK". Stainless Steel version of our popular E550 'Forced Induction' Vapor Scrubber Unit. 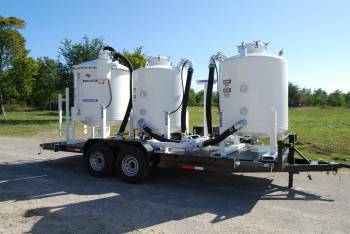 Complete trailer mounted vapor scrubber including Eliminator vapor scrubber and twin 1000 pound carbon vessels.